Even today, in the modern computerized world, not eveyone has the opportunity to purchase more than one computer in a family. There are many reasons for this and one of them is proble of free space in the house. Today, we offer the best solution for almost any problems related to having several computers for multiple users. ASTER, software will have you make the most out of your computer's capabilities. 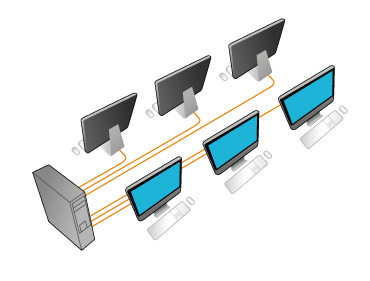 First of all, ASTER will allow you to user several monitors from one computers and make the usable to several users as a standalone computer. To do this, you need to purchase monitors, video cards and keyboard/mouse as required. This allows you to have required number of workplaces at your home and a total of 1 computer. You can even use laptop to get an additional workplace. ASTER allows up to 12 workplaces to be created from one computer within the little space you have available, while reducing noise levels significantly as well as electricity consumption. Workplaces are additional session of users on the computer with a common Operating system (Windows XP/7/8/8.1/10). This means using ASTER, along with additional monitors and keyboard/mouse to create 2 or more workplaces. In multiseat enviroment, each user will have access to internet, printer, scanner, Office Software package as well as any resources connected to the system. Also you can play games on additional workplace, or do other work without interferring with each others. ASTER program has undergone multiple testing in many environment, and as a result it can be used to create additional workplaces in any enviroment. As compared to other products, ASTER is easy to install, works perfectly, and can be used in computers with minimum specifications. As mentioned above, multiple users can use one computer for office programs, small application and even games. Workplaces can be configured so that they will logon to windows automatically with provided credentials. Once logged on, user can customize their desktop as they see fit and no other users will be affected. But if you logon to same user in all workplaces, then when all the workplaces start up, they will see the same desktop and have changes reflected to each of them when one user changes any settings for the computer.